FRANCE: Utility EDF's renewables division benefited from an increase in power output in 2017, but its operating profit (Ebitda) dropped 12.8% year-on-year. EDF Énergies Nouvelles posted Ebitda of €751 million for 2017, down from €861 million one year earlier. It had also recorded sales of €1.28 billion, up 8.7% from its 2016 sales figure of €1.17 billion. But the company stated the fall in its operating profit was due to "lower sales of assets than in 2016". EDF does not provide a figure for sale of its renewable energy assets for 2016 or 2017. Electricity output from its renewable energy arm increased 10.9% year-on-year, generating 12.6TWh in 2017. Meanwhile, output from its hydropower facilities grew by 12.5% year-on-year, while its nuclear power plants in France and the UK produced 1.3% and 1.8% less respectively. EDF’s net installed capacity of wind and solar projects grew by 1.6GW to 8.8GW in 2017. It also acquired a 600MW portfolio of 11 Scottish wind farms, in July. 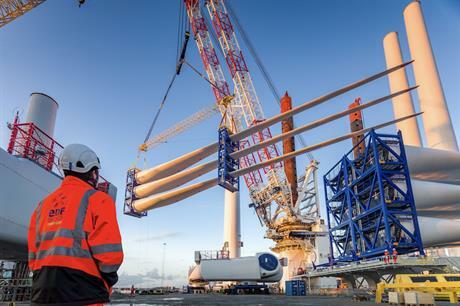 EDF‘s renewables division also began installing five MHI Vestas 8.3MW offshore wind turbines using gravity-based foundations near Blyth in the north-east of England, and acquired offshore wind operations and maintenance (O&M) firm OWS. Worldwide, the group has a wind and solar pipeline of 22.5GW — 1.9GW of which is under construction, it stated. Jean-Bernard Lévy, EDF’s chairman and CEO, said: "We are beginning an unprecedented acceleration in renewable energies at the same time that we are strengthening our commercial initiatives." The wider group, meanwhile, blamed a decline in nuclear and hydropower output in France and "unfavourable price conditions in almost all geographic areas" as its operating profit (Ebitda) fell 16% last year. The company’s Ebitda for 2017 was €13.74 billion, down from €16.41 billion in 2016, while its sales fell 2.2% year-on-year from €71.2 billion to €69.63 billion.